What does democracy look like? 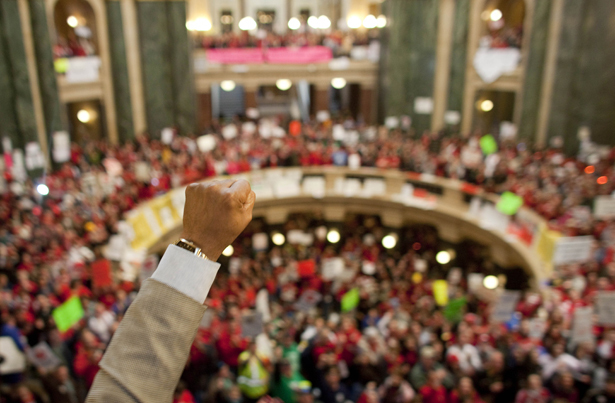 Try a grassroots campaign organized by ordinary citizens to recall their union-busting governor. What does democracy look like? How about this: a governor, swept into office on the GOP wave of 2010 with a financial assist from the billionaire Koch brothers, pivots immediately from moderate talk about job creation to radical austerity that divides his state more than any in the Union. He attacks the collective bargaining rights of public workers and teachers. When hundreds of thousands of citizens rally to oppose his agenda, the governor and his allies respond by attempting to bar protests in the Capitol. They reject their state’s tradition of open and transparent government, dismiss criticisms from the opposition—even from moderates in their own party—and begin gerrymandering districts and changing election rules, actions Common Cause and the League of Women Voters recognize as assaults on voting rights. Faced with a serious threat to basic rights and democracy, citizens organize a grassroots campaign to recall and remove the governor, the lieutenant governor, the State Senate majority leader and key legislators. 2 million names—the largest portion of a state’s population ever to demand the removal of a governor and his lieutenants. This is not progressive populist fantasy. This is happening right now in Wisconsin, where the January 17 deadline for filing recall petitions saw activists from the grassroots group United Wisconsin and their allies file more than a million petition signatures—almost twice the required number—to force a recall of Governor Scott Walker, 845,000 signatures to recall Lieutenant Governor Rebecca Kleefisch, more than 20,000 to recall Senate majority leader Scott Fitzgerald and another 60,000 to recall three of Fitzgerald’s fellow GOP senators. “Scott Walker and his supporters tried to demean and marginalize recall circulators, but in Wisconsin winter, an army of more than 30,000 Wisconsin-born and -bred recall volunteers took to street corners, malls, places of worship, dinner tables and sidewalks to take their state back,” declared United Wisconsin board member Ryan Lawler. Even newspapers that had endorsed Walker (and opposed the recall) marveled at the accomplishment with front-page shouting headlines like One Million Signatures! The remarkable response to a GOP governor whose anti-labor and pro-corporate agenda in most ways parallels those of the Republicans who would be president and who lead Congress offers an indication of how people-powered uprisings can resist what progressives of another era decried as “the money power.” It also holds out the prospect of a new politics that could yet change this year’s electoral calculus. Walker won’t face “immediate” dishonor. Wisconsin law requires recall campaigners to wait a year before filing their petitions, and the governor has hired a legal team to delay his accountability moment. When it does come, Democrats will need a candidate (several legislators and former statewide candidates are running, but many activists hold out hope that a reluctant former US Senator Russ Feingold will reconsider his decision not to) and a renewal of the labor-farm-community coalitions that formed to recall two GOP state senators last year. Among supporters, there’s little doubt the movement will build. And little doubt that it will spread. In fact, that’s already happened. In November, Ohio unions and their allies used another progressive reform tool, the initiative, to qualify a referendum vote that rejected Governor John Kasich’s variation on Walker’s anti-labor law by a 61-to-39 margin. Mainers used an initiative to overturn a right-wing assault on same-day voter registration. There are active movements to recall and remove other right-wing governors, including Michigan’s Rick Snyder. Common Cause is pushing to hold statewide referendums across the country this fall on amending the Constitution to get corporate money out of politics; Move to Amend is promoting local referendums on the issue.